Original View of Colonnade Row at Lafeyette Street. Colonnade Row is one of the first unified upscale housing enclaves in New York City. New York City has been moving uptown since the day it was founded. By the 1830s, the prominent members of New York Society were establishing themselves around Lafayette Street. Unfortunately, New York Society didn't linger long there and soon marched up Fifth Avenue after 1860 to build splendid mansions to rival European Palaces. Colonnade Row, now in decline became divided up into smaller apartments, a hotel and other uses. By 1900 half of the row was demolished and the rest continued into a neglected state. That half is still around today and for many who live in New York City or have visited and passed these remaining structures, one always takes a New York minute to stop and wonder. Last year, Mansions of the Gilded Age, written by myself, Gary Lawrance was contacted by Timothy Ranney, one of the apartment dwellers in Colonnade Row to help organize a series of events related to the Gilded Age era of New York. 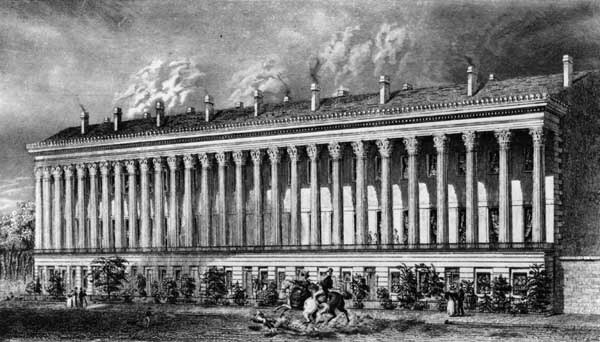 One of the first events we held was a talk by the very knowledgeable Michael Rayhill, who after completing his design thesis on Colonnade Row, probably knows more about the history and background of the early residents than anyone. A few weeks ago Alex Vadukul from the New York Times, attended one of Mr. Rayhill's encore presentations. In today's Metropolitan section of the New York Times he wrote a wonderful article about Colonnade Row and the wealth of information Mr. Rayhill treated us and a small audience of followers of Mansions of the Gilded Age and Mr. Ranney's Colonnade Row Social media sites. You can read Mr. Vadukul's article, "Life on Colonnade Row:The Hidden History Behind the Columns". HERE. Mansions of the Gilded Age and Colonnade Row are both very actively involved with spreading the word on the history of the Gilded Age through lectures and other events. We try to give one or two events each month, mostly in the New York City area. Please follow us on our respective social media platforms. Mansions of the Gilded Age on Facebook, a group with almost 35,000 members. The Gilded Age Society on Facebook, a group with over 10,000 members. The Gilded Age Society on Instagram, with over 3,000 followers.